Commercial facial cleansers and toners can take a big chunk out of a hard-earned paycheck, and those products are often filled with a variety of undesirable preservatives, colors and fragrances. Healthy, nontoxic ingredients in your kitchen cupboard can be effective, additive-free alternatives to commercial products, and they won't take a huge bite out of your budget. Choose ingredients appropriate for your skin type. Oatmeal is found in a several commercial skin-care products and are easily incorporated into effective homemade cleansers that benefit nearly any skin type. Combine a cup of oats with a teaspoon of your favorite skin cream for a dry-skin cleanser. Add a teaspoon of plain yogurt to a cup of oatmeal for oily skin. Mix a teaspoon of honey into a cup of oatmeal for normal skin. Use whole oats or rolled oats. Avoid instant or quick-cooking varieties. Oily skin benefits from a tomato skin toner. 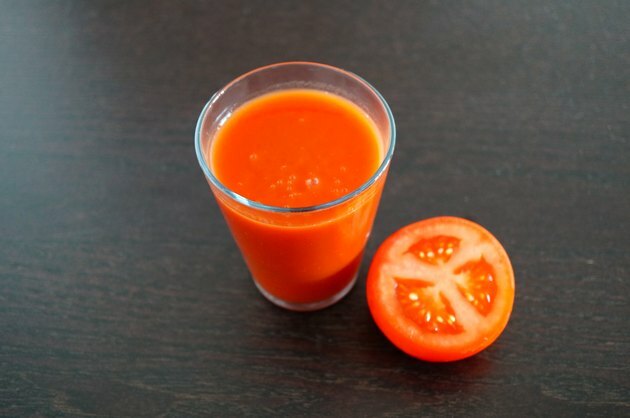 Combine canned tomato juice with enough honey to make the mixture sticky. Alternatively, blend a fresh, ripe tomato with a small amount of vodka and a cucumber. A toner made of a tablespoon of tomato juice and a few drops of lime juice helps to shrink enlarged pores. Add the oil from a vitamin E capsule to make a moisturizing toner for oily skin. Lemon juice makes an effective cleanser for oily skin. Combined with a small amount of powdered milk or oatmeal, the cleanser exfoliates skin. Use lemon juice and plain yogurt for a soothing cleanser for acne or irritated skin. Mix lemon juice with other fruits like kiwi or strawberry to make an impromptu oily-skin cleanser. Green tea is known for its many health benefits, and simple green tea skin toners are no exception. Use loose tea, or cut open a tea bag. Mix the loose tea with mineral water. Add a few drops of lemon or lime juice to the tea and mineral water, and you have an effective toner for oily skin. Pour the toner into a spray bottle, and store the toner in the refrigerator for a cooling, hot-weather toner. Because of its soothing, hydrating qualities, honey is beneficial for any skin type and can be used in a nearly endless variety of cleansers and toners. Blended with a cucumber, honey makes an effective toner for combination skin. Mix honey with ground almonds for a gentle, exfoliating skin cleanser. Add a few drops of lemon juice to the mixture for oily skin. Use honey mixed with a small amount of sugar for an exfoliating lip scrub. Stir castile soap into honey for an effective, all-purpose facial cleanser.